Since election night, the stock price of the 'failing Ny Times' is up a little more than 75%. Their online subscriptions have been soaring and business is booming -- all thanks to President Trump. Palace intrigue is the culprit. For those of you that still believe the MSM is dying, I am here to tell you otherwise. The final redpill is knowing that Trump was elected to bailout the main stream media and convert democrats into deep state loving war mongers. The NYT reported earning this morning, beating estimates -- helped by a 63% jump in online subscriptions. Reports Q2 (Jun) earnings of $0.18 per share, excluding non-recurring items, $0.04 better than the Capital IQ Consensus of $0.14; revenues rose 9.3% year/year to $407.1 mln vs the $393.07 mln Capital IQ Consensus. Paid digital-only subscriptions totaled approximately 2,333,000 at the end of the second quarter of 2017, a net increase of 114,000 subscriptions compared to the end of the first quarter of 2017 and a 63.4 percent increase compared to the end of the second quarter of 2016. Second-quarter print advertising revenue decreased 10.5 percent, while digital advertising revenue increased 22.5 percent. Digital advertising revenue was $55.2 million, or 41.7 percent of total Company advertising revenues, compared with $45.0 million, or 34.3 percent, in the second quarter of 2016. Guidance: Total subscription revenues in the third quarter of 2017 are expected to increase at a rate similar to that of the second quarter of 2017. Total advertising revenues in the third quarter of 2017 are expected to decrease in the mid- to high-single digits compared with the third quarter of 2016. Operating costs and adjusted operating costs are expected to increase in the mid-single digits in the third quarter of 2017 compared with the third quarter of 2016. This tweet likely added 10,000 subscriptions By what I can see, the company is doing quite well and not 'failing' at all. As a matter of fact, their online business is thriving and quickly displacing traditional print. It's also worth noting, the stock price hasn't been this high since 2007. 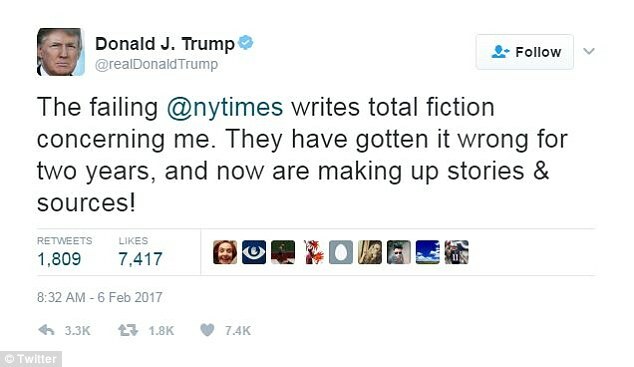 You cannot buy advertising like this According to the Trump Twitter archive, Trump has tweeted about the NY Times at least 121 times.